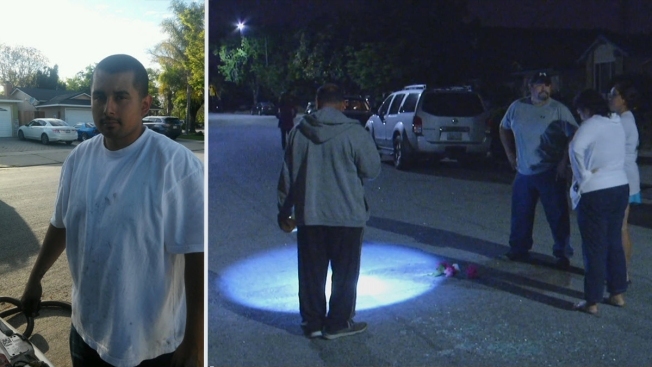 San Jose police are investigating the city's 13th homicide after a young father was shot and killed late Monday night, most likely on his way to sell a pit bull puppy, his friends said. Police said someone called 911 about 11 p.m. saying that a man had been shot in the 2700 block of Sand Point Drive. He was pronounced dead at the scene. The suspect or suspects have not been found, and a motive is unclear, according to Lt. Chris Monahan. Monahan said the man got into some sort of argument with people who drove by in a car. Monahan said the man did not live in the neighborhood, which he described as a "nice" one. "We're still a little puzzled about what happened beforehand," he said. His younger sister, who did not want to be identified, said that her brother, Carlos Ogeda, 25, had just taken his puppy for a walk and was on his way home, when he got in some sort of fight with someone before he was shot. "We didn't hear any arguing," she said. "It was peaceful" before she and others heard "pop, pop, pop." His brother told NBC Bay Area he thinks that Ogeda might have been trying to sell his pit bull before he was killed. Ogeda had chosen what he thought was a neutral neighborhood to make the transaction, the brother said. His family said Ogeda was a good father to his 6-year-old daughter, and was in a steady relationship with the girl's mother. They also said he was not involved in any gangs. Ogeda's loved ones came to the middle of the street to grieve and lay flowers where he was shot. "He was the best," said stepfather, who did not want to give his name.